Ten men in Western Wear, standing, sitting and sprawled around a campfire with a kettle hanging over it. 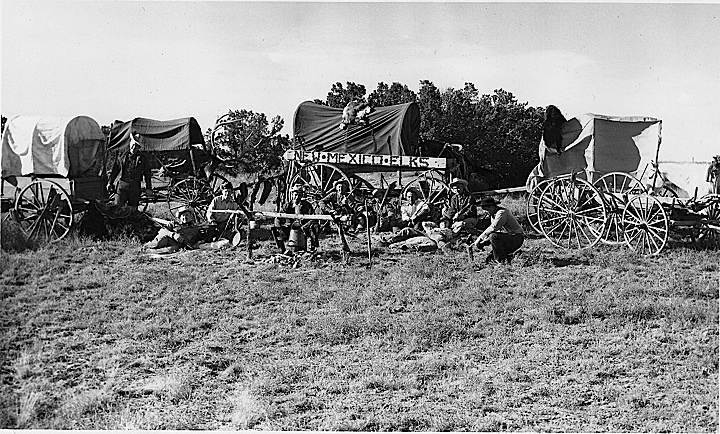 Several wagons are pulled up behind, two with animal pelts draped over the top. A hand-painted sign in old-timey, sawtoothed letters reads “New Mexico Elks,” background. Gelatin silver print. Press-style black and white 8×10. Part of a large lot of photos of African American subjects, a large portion of which were of IBPOEW events and personages. 8 images were selected from the lot to catalog into this collection. Standing portrait of a man and four women. Women are in seemingly colorful evening gowns. 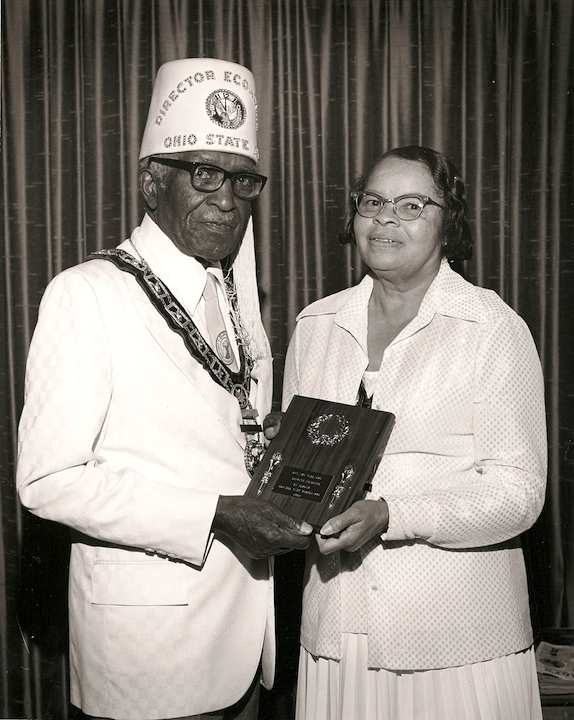 Woman dexter wears an officers jewel that reads “Nettie Smith, Grand Dtr. Ruler”. Woman sinister can also be seen to be wearing an officer’s collar. 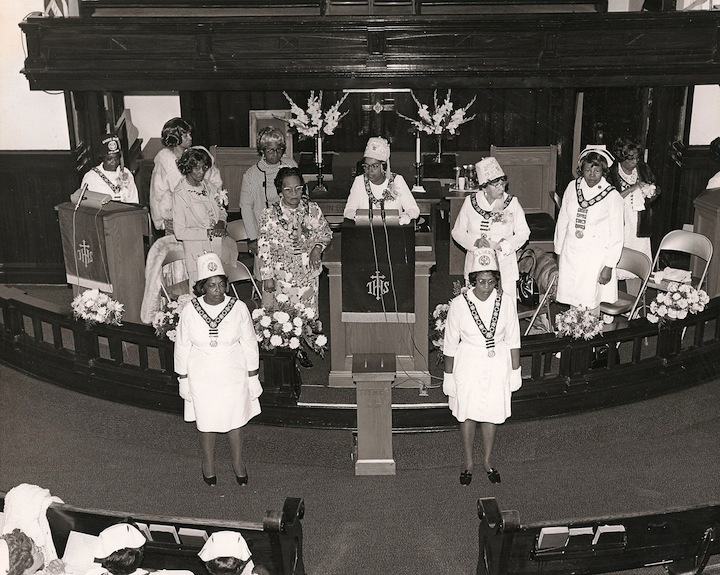 View from above of 11 African American women clustered around the pulpit of a church. Several of the women wear matching white uniforms, several have white IBPOEW fezzes on, another wears a dark-colored fez, many of them wear officer’s collars. 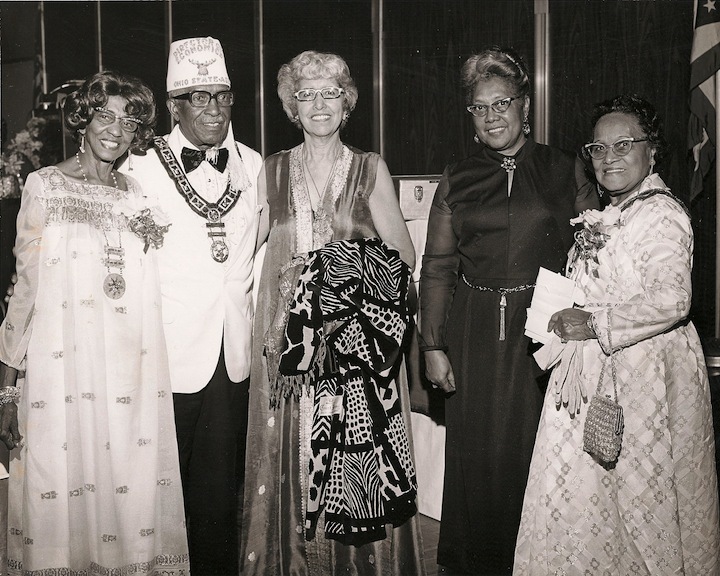 The fezzes of the two women flanking front and center have round emblem patches and read, “CIVIL LIBERTIES”. The fez worn by the woman speaking at the microphone has an embroidered/rhinestone elk emblem and reads “CIVIL LIBERTIES | IBPOEW | ASST. GRAND DIRECTRESS”. To speaker’s left, one of the women wears a folded cloth “nurse” style hat, and two of the women visible LL seated in audience wear similar hats. 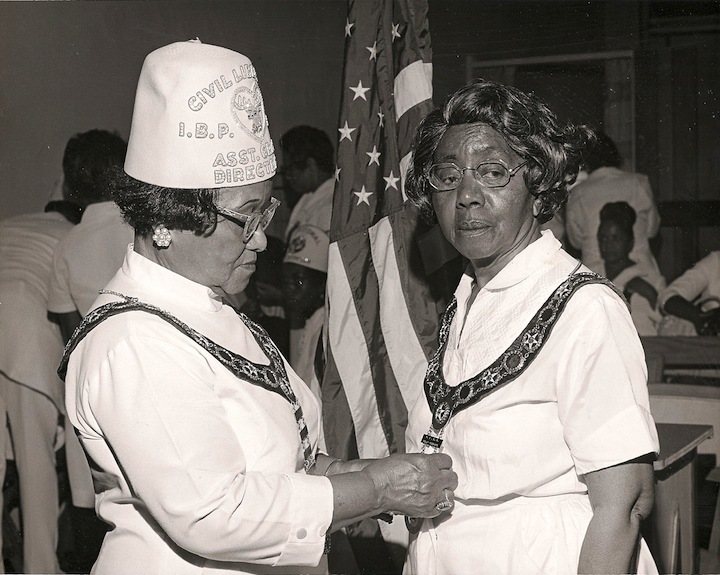 Two African American women, Daughter Elks, both in white and both wearing officer’s collars, standing in front of an American flag. . Woman wearing a white fez seems to be adjusting the pendant name plates or jewel of her companion’s collar. Her fez reads “CIVIL LIBERTIES | IBPOEW | ASST. GRAND DIRECTRESS” and has an embroidered (bullion?) and rhinestone elk emblem, surrounded by a heart-shaped border of rhinestones. The second women’s collar plate reads “P.G.D.R.” (Past Grand Daughter Ruler), and her first name “Dolly” is also legible. She appears distracted, or tired. A large number of other people, all also in white, can be seen milling or sitting in background. Gelatin silver print, slightly toned. Press-style black and white 8×10. 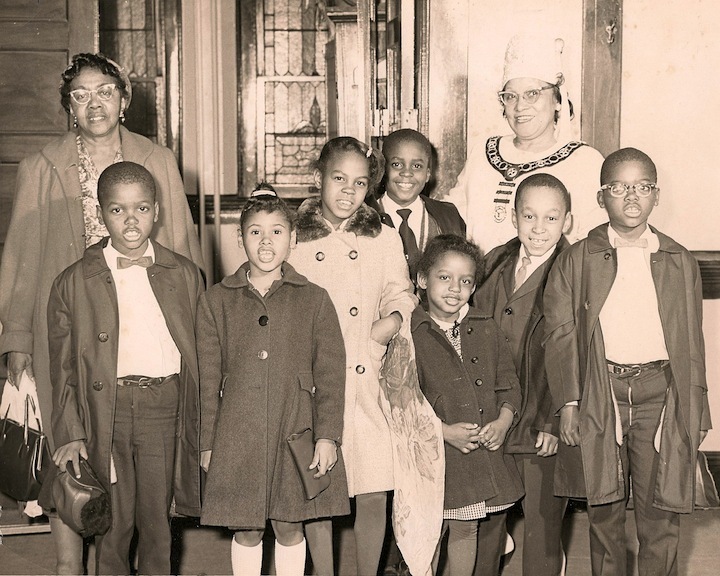 Two African American women, Daughter Elks, standing with 7 African American boys and girls, probably aged 8-12, all seemingly in their Sunday finest. Behind the group is a stained glass window, probably taken at a church. Woman sinister wears a white IBPOEW fez and officer’s collar, but details are washed out. Recto, blue ink crop marks in margins at all corners. Group portrait of four men and one woman. 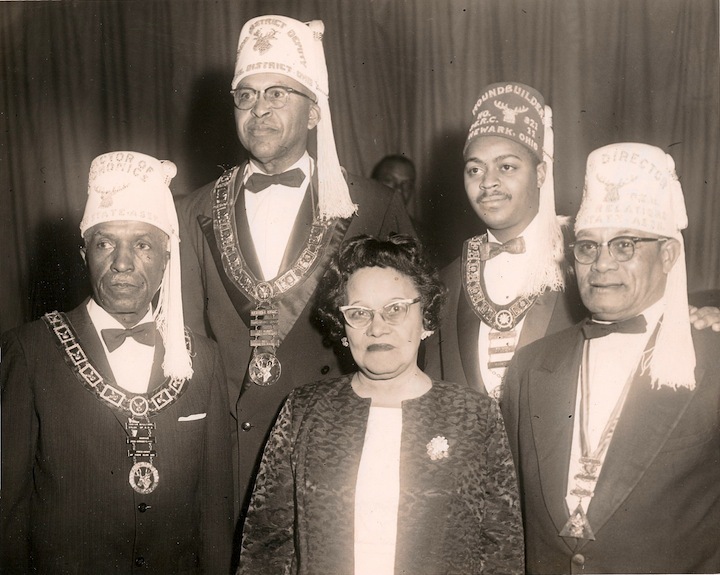 The men all wear tuxedos, IBPOEW officer’s collars, and IBPOEW fezzes, denoting various offices and lodges. The men all look to viewer’s left, the woman faces the camera. Stamp lacks zip code, suggesting a date (at least for the stamp) of 1963 or earlier. 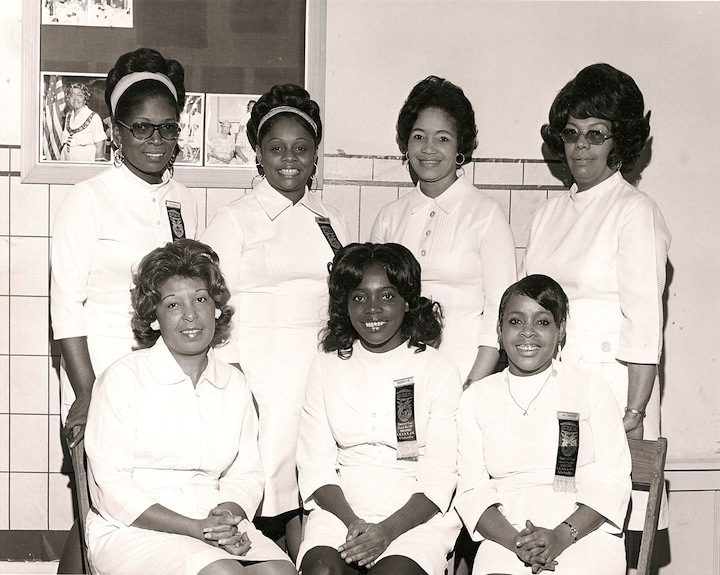 Behind them on a bulletin board are pinned up 8×10 pictures of other Daughter Elks, including the older woman from TAFC.2012.31.4. 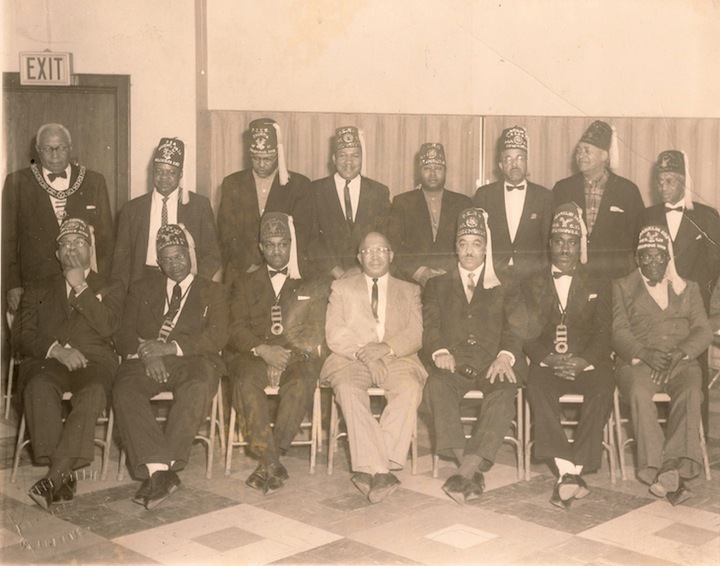 Group portrait of 15 African American men, all in suits, most of them wearing IBOPEW fezzes. Several of the men also wear officer’s collars. Eight stand behind 7 seated in folding chairs. Man seated sinister of man in light colored suit holds a gavel. Man seated far dexter draws from a cigarette posed between his fingers. Lettering on fezzes is not legible, but they appear to denote a variety of offices, as well as perhaps members of different lodges. Some can be seen to read “Columbus, Ohio” across the brow, others are illegible but obviously are from other cities. Photo is on heavy paper and printed in tone with a textured surface, suggesting a mid-century date for the object. Maker’s embossed stamp in LL corner, but is illegible, except for denoting Columbus, OH. If have Elk photos to display, who do I send them to?